When a National Football League player is released by the team that employs him, that team is often left with what is commonly called “dead money.” It is a phrase used to describe the amount of guaranteed money that remains on a player’s NFL contract when he is no longer playing for the team that signed him. Importantly for teams, dead money counts against their future salary cap. Sometimes it fully applies for the following year and other times it is spread over the next two seasons. Basically, it is not a great look for NFL teams to carry a lot of dead money. It eradicates cap space and is a debt that must be paid with no actual performance received in return. Which team is the worst when it comes to dead money? Enterprise Resource Planning and Customer Relationship Management company WorkWise recently did the math to figure it out and added a data point showing the number of median household incomes that could be paid by that dead money. Coming in first (or last) is the Buffalo Bills. 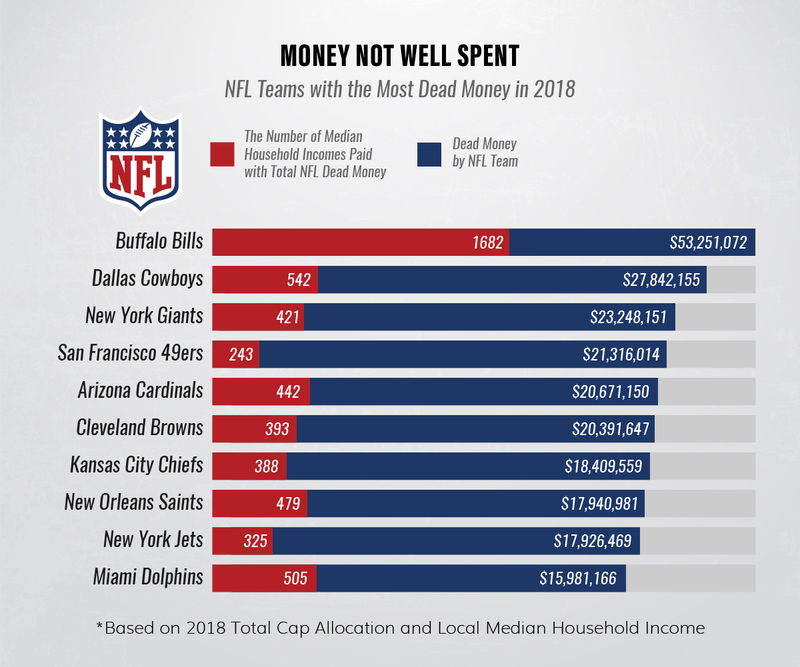 The Bills have a total of $53,251,072 in dead money, which could pay the household incomes of 1,682 Buffalo locals, per WorkWise. Next is the Dallas Cowboys with $27,842,155 in dead money, the equivalent of 542 Dallas households. In third is the San Francisco 49ers, only a slightly better than the Cowboys. The franchise’s $21,316,014 in dead money could fund the lifestyles of 243 San Francisco locals. The 49ers organization is followed by the Arizona Cardinals, which could pay for 442 Arizona households in 2018. Instead, $20,671,150 goes to players no longer performing for the team. Rounding out the top five is the Cleveland Browns, with a total of $20,391,647, or enough money to support 393 Cleveland families.